Broken pipes, overflowing washing machines, bathtubs, sinks, stools, and natural floods can all create situations that require water damage restoration in Roswell. How do events like these affect different types of floors? When carpeting gets wet it’s important to remove the water as quickly as possible. 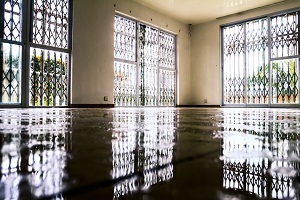 Water can damage the materials that make up the carpet and cause staining and discoloration. Carpet that isn’t thoroughly dried right away is susceptible to mold growth. Studies show that mold can create potential health hazards for you and your family. If you face a situation that includes wet carpeting, it’s wise to hire a water removal service in Roswell to dry and disinfect it properly. Wood flooring is susceptible to water damage. It can lose color, be stained, and get warped. Thankfully, there are techniques to deal with these problems. There are times, though, that the only solution will be to replace the floor. If you spill water on laminate flooring but promptly wipe it up, the floor isn’t damaged, but if it’s saturated with water, it can become warped. When the seams between the planks are saturated, they swell. If this occurs, the planks will need to be replaced, but it can be very difficult to match laminate. Tile, concrete, and other stone floors often stand up well to water problems and may only require cleaning and sanitization. Concrete can become discolored, but is usually cleanable or easily painted over. Tile floors probably won’t be damaged, but fresh grout may be needed. Vinyl flooring is often glued to the subflooring, but it can also float on top of it. Either way, water can seep underneath and cause problems. Moisture weakens glue and softens the vinyl, which then deteriorates. There’s also the possibility of mold growth. Companies that specialize in commercial and residential water restoration in Roswell use principles of extraction, air movement, dehumidification, and advanced moisture detection equipment to ensure structures are dried and returned to a healthful state.